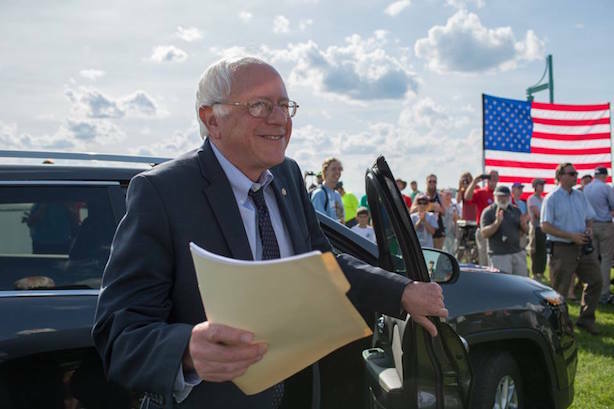 Sanders to address supporters via live-stream; Obama to visit Orlando; Clinton previews economic plan of attack on Trump; Volkswagen CEO: Automaker needs billions in investments to transform company; Connecticut senator's marathon filibuster forces gun votes. Bernie Sanders will outline a path forward for supporters on Thursday night. (Image via the Sanders campaign's Facebook page). Bernie Sanders is set to address his supporters Thursday night via a live—streamed video message. One of his spokesmen told Reuters the Vermont senator will not end his campaign or endorse Hillary Clinton, but outline policy goals. Clinton won support from enough delegates last week to seal up the Democratic nomination. President Barack Obama will visit Orlando on Thursday to pay his respects to victims of the Pulse nightclub shooting, in which 49 people were killed and 53 were wounded early Sunday morning. The shooter, Omar Mateen, posted messages of allegiance to the Islamic State on Facebook after beginning the massacre on Saturday night, lawmakers told media outlets on Wednesday. The father of a victim of the November terrorist attacks in Paris is suing Facebook, Google, and Twitter, claiming they provide "material support" to terrorist groups. Wells Fargo, J. P. Morgan, and Disney are among the companies providing financial aid to victims’ families. Hillary Clinton previewed her line of attack on Donald Trump on domestic policy for USA Today, saying he is "temperamentally unfit" to steer the country’s economic agenda. She also promised to close tax loopholes for wealthy Americans. The former secretary of state is planning to give a major economic address next week, mirroring her speech early this month attacking Trump on foreign policy. Trump said Wednesday that he will meet with the National Rifle Association about banning people on the terror watch list from buying firearms. Volkswagen chief Matthias Mueller said Thursday morning that the automaker must tighten its belt and operate much more efficiently to rebound from its emissions scandal. The carmaker is planning to roll out 30 electric vehicle models by 2025 as part of its plan to embrace battery-powered vehicles. Mueller said tens of billions of dollars in investments will be needed to reach those goals. Sen. Chris Murphy (D-CT) endured a marathon, 15-hour filibuster running into Thursday morning to force Republican senators to allow votes on gun restrictions. The Democrats want votes on banning those on the terrorism watch list from buying firearms and for background checks on firearm purchases at gun shows and on the web.